What is happening out in Hays County is unfathomable to most of us. We live in the foothills of the Texas Hill Country and are accustomed to its dark skies and quiet nights. Just miles down the road in the unincorporated town of Henly, where no rules and no holds barred are the only rules for commercial developers, a nightmare started just six months ago. It is a nightmare that has resulted in too many losses and no community gains: gone are the dark skies, quiet nights, scenic vistas and quality of life. In the months since the Field of Dreams has opened, small businesses are losing revenue; residential property values are plummeting; and, local nearby livestock can no longer differentiate between night and day. Henly is losing its Hill Country heritage. Sadly, the conclusion reached by the Henly residents is despite the developers claim that “They say they are promoting a youth sports and doing a community service,” they, in fact, “are strictly out there to make money.” If you factor in the number of fields, the numbers of cars and people, and the number of games per field per day for Select Baseball play, they could potentially make up to $45,000 a day on a busy weekend. Ultimately, it is about their bottom line. And, what is left for the families who live and work there is a fight. A fight to find a way to retro-fix all the damages and nuisances that could have been prevented. For the citizens of Henly, the Field of Dreams is a never-ending nightmare. The Field of Dreams is an 18 acre parcel of flat land situated in the unincorporated town of Henly. It consists of 9 Baseball/Softball Fields, Batting Cages, and Concessions constructed and covering property/lot line to property/lot line. It is owned principally by Austin Select Baseball CEO John Martin and COO Sean Kinkaid but has an additional 13-15 private investors. Of those 9 fields, 8 are for youth aged Select players, and 1 is for senior aged Select players with No Adult usage. All fields are lighted. The total number of 40ft. tall lighted poles is 23. They use 170 fixtures of 1,500 watt high density discharge sports lights for a total aggregate of 255,000 watts of unshielded light emitted when all fields are lighted. Because of the size and maximum use of space, this development can host up to 80 teams per week and is marketing itself as an a Select athletic destination in order to host regional, state, and national events. It sits off of a 2 lane straight country road with informal parking and has had as many as 300-400 vehicles, including RV’s, on a busy day, which translates roughly into 700-800 people in foot traffic on the site. 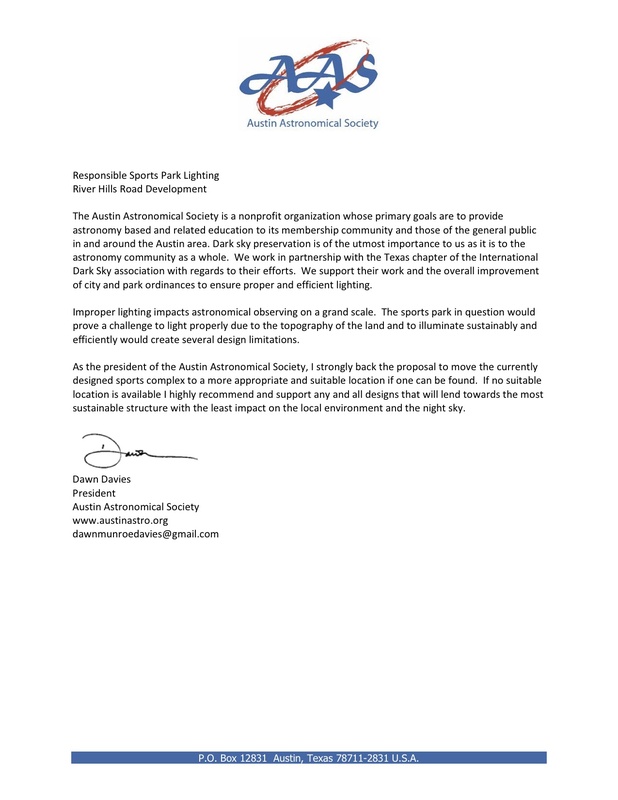 The River Hills Sports Park is proposed to be developed on 50 acres on a parcel of land straddling and sitting atop 2 prominent hilltops located in the City of Austin and Travis County Extra Territorial Jurisdiction (ETJ). Its site plan currently consists of 8 Baseball/Softball Fields and 4 Multi-Purpose Fields for Soccer, Lacrosse, Rugby and Football, 3 Tennis Courts, 8 Batting Cages, Concessions, and a 60,000 Square Foot Indoor Multi-sports Facility. Plans also include 669 Parking Spaces. Both Adult and Youth leagues/teams/players may access and utilize the complex. With 365 days a year use allowed by lease… hours theoretically extending from 6:00AM-10:00PM, depending on season, but practically anticipated to run until games are done… no provision for enforcement by the landlord of any lease criteria including lights and sound… and lease language which allows not only for Tournament-Hosting but also which will allow the site to be outsourced for other currently unspecified, revenue-generating events, it is safe to say that this is no mere park. It is a Mega-Sportsplex designed for high density, high frequency usage in order to maximize revenue. The River Hills Mega-Sportsplex is designed to exceed the Field of Dreams in size, scale and scope. Unlike Henly, though, it will sit 200 ft above surrounding neighborhoods on our distinctively steep hilltops in the Texas Hill Country. Because of this unique location and its massive topographic footprint, the projected reach and scope of our light trespass will be without precedent at more than 20 square miles. Henly’s nightmare will be ours ten-fold…unless we tell our decision makers that this offense to our community is unacceptable and urge them not to turn a blind eye to this monumental light trespass as it goes through the permitting process with City of Austin. Help to protect and preserve our dark skies by emailing now. Before we find ourselves trying to mitigate the unmitigatable. Find out what the Austin-American Statesman wrote on Sunday, November 10th about Henly’s Light Pollution Plight by clicking here (requires subscription). Read letter of support for WNA’s efforts from the local chapter of the International Dark-Sky Association (IDA), by clicking here. This entry was posted in Posts on December 10, 2013 by westlake editor.